It was almost sundown near the village of Neucy, Belgium. A thick fog had settled over the ground, worsening the already poor twilight visibility. 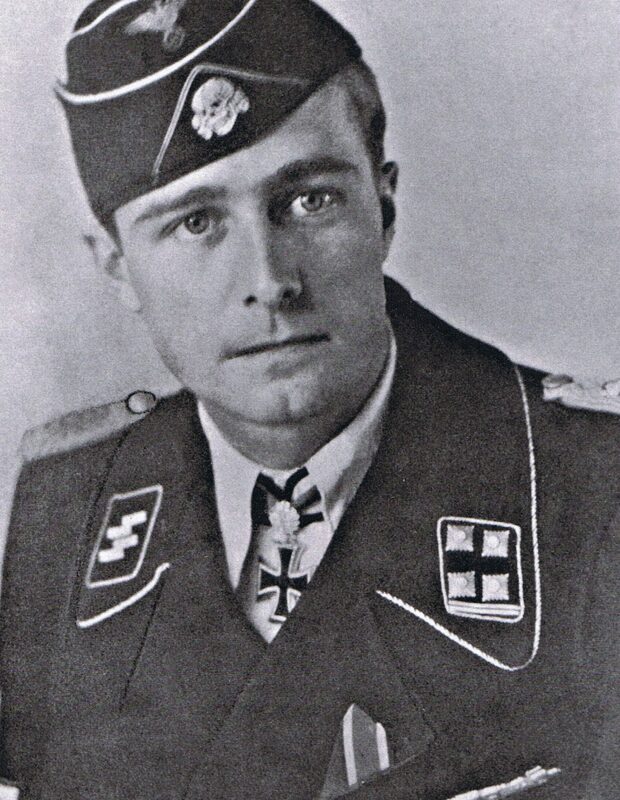 SS Lieutenant Colonel Joachim Peiper squinted down the road, past the lead tanks of his panzer column and towards the Neufmoulin Bridge, a small wooden structure barely discernable in the haze. The bridge spanned a creek and carried the road into the village of Habiemont. Standing tall in the cupola of his tank, Peiper peered through his binoculars and looked again towards the bridge, where he noticed several fog-obscured figures scrambling across the bridge to the opposite bank. The column’s lead panzer opened fire on them with its hull-mounted machine gun. A few other tanks followed suit and, within seconds, the whole front of the panzer column was blazing away at the area around the bridge. Several of the figures ran off of the bridge and faded into the fog just as an 88mm high-explosive round detonated, kicking up dirt, grass, rocks, and shrapnel. The “damned engineers” who halted Peiper’s column on the evening of 18 December 1944 were soldiers of the 291st Engineer Combat Battalion. The demolition of the bridge at Habiemont was but one of many important actions performed by the 291st in the European Theater of Operations during World War II. The battalion was consistently at the fore of the U.S. Army’s campaign to defeat Nazi Germany, from Normandy to the Battle of the Bulge and into the German heartland itself. The battalion began as one of the many units organized to bolster the United States Army in the months following the nation’s entry into World War II. Constituted on 19 December 1942 as 2d Battalion, 82d Engineer Combat Regiment, it was activated on 25 January 1943 at Camp Swift, Texas. 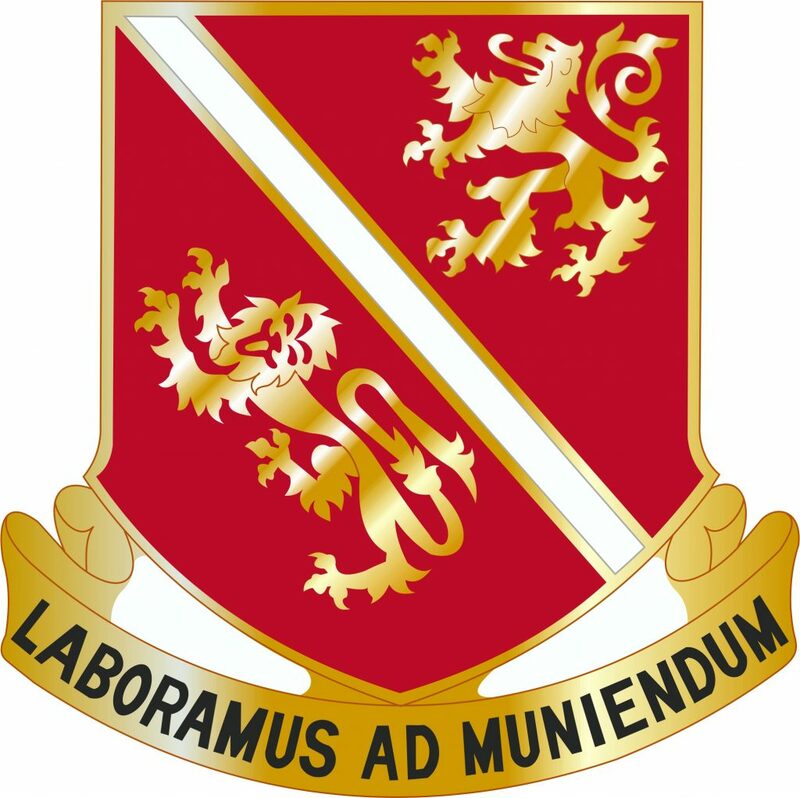 Two months later, the battalion was reorganized and redesignated on 29 March 1943 as the 291st Engineer Combat Battalion. After a one-month training session at the Louisiana Maneuver Area from 26 July to 26 August 1943, the battalion returned to Camp Swift for a couple of weeks before receiving orders to Camp Myles Standish, Massachusetts, on 11 October 1943. From there, the 291st made the short trip to Boston Harbor, embarked on a troop transport, and arrived in England on 18 October. In addition to their diverse backgrounds, the enlisted men of the 291st were remarkably young, with an average age of just nineteen. 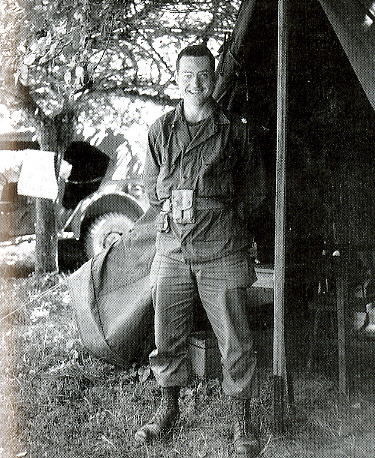 This youthfulness was embodied in the battalion’s leader. Pergrin had graduated from Pennsylvania State University’s Reserve Officer Training Corps program in 1940; in 1943, at the age of twenty-six, he assumed command of the 291st. Despite their collective youth, the wartime performance of the 291st and the leadership of Pergrin proved to be of the highest quality. After months of training in England, the engineers of the 291st received their first combat assignment a couple of weeks after D-Day. On 24 June 1944, the 291st sailed across the English Channel to France, where their mission was to maintain the military supply route (MSR) between the Norman towns of Carentan and St. Mère-Église. This route was the only hard-surfaced road connecting Utah and Omaha Beaches and served as a vital logistical artery in the Allies’ campaign to break out of northern France and drive the Germans eastward. The 291st spent the following months supporting First Army in its campaign through France and arrived in Belgium on 17 September 1944, just as the Allied summer offensive was winding down. Here they built bridges and conducted maintenance on First Army’s rapidly lengthening MSR. The 291st moved into Luxembourg on 24 September to do more of the same work before returning to Belgium on 29 September. For the next couple of weeks, the battalion moved from town to town within Belgium, performing low-intensity engineering tasks while waiting for the Allied offensive to resume. During this lull in the action, Pergrin’s battalion built several bridges in Belgian towns such as Berledang, Salmchateau, and Trois-Ponts. These structures would later be of great significance in what later became known as the Battle of the Bulge. The Allied offensive resumed in November, and soon the men of the 291st were once again supporting First Army’s advance. After achieving some initial success, the Allied offensive ground to a halt. For much of the next month, there was little fighting along the front, and some units, including newly arrived “green” divisions and others needing rest and refit after being mauled in the Hürtgen Forest, manned a quiet sector in the Ardennes. In the early morning hours of 16 December 1944, German forces launched a surprise offensive in the Ardennes Forest. At 0530, the predawn stillness erupted in a massive artillery barrage that heralded the advance of General Joseph “Sepp” Dietrich’s Sixth Panzer Army towards the unsuspecting, thinly-held American lines. The Battle of the Bulge had begun. Panzers and accompanying infantry took the Allies completely by surprise, routing and cutting off entire divisions. Additionally, bad weather left the Americans unable to rely on their vaunted air power. As the Allied command attempted to organize a defense, Pergrin was put in charge of holding the Belgian town of Malmédy, which featured a road network vital to the German assault. He promptly ordered a dozen roadblocks to be set up and defended by soldiers of the various engineer units under his command. It naturally dawned on me that the manpower and weapons I needed were slipping westward through our lines, so I tried to convince passing units to throw in with us. I failed miserably. I was not able to convince officers of routinely transiting elements of the 7th Armored Division to commit even modest combat resources to the defense of Malmédy…that I could elicit no aid was stupefying…There was no one left in Malmédy except diehard civilians and my own valiant engineers. On 17 December, the second day of the German offensive, the Allied lines remained in flux as more and more American units retreated ahead of the panzers. At around 1200, yet another group of American troops passed through Malmédy: a convoy carrying Battery B, 285th Field Artillery Observation Battalion. Despite Pergrin’s request that Battery B join his engineers in the defense of Malmédy, the battery’s officers insisted upon following their original orders to link up with the 7th Armored Division at St. Vith. Frustrated, Pergrin watched as the convoy departed. The three men encountered by Pergrin and Crickenberger were survivors of one of the most infamous atrocities committed on Allied prisoners of war during World War II. 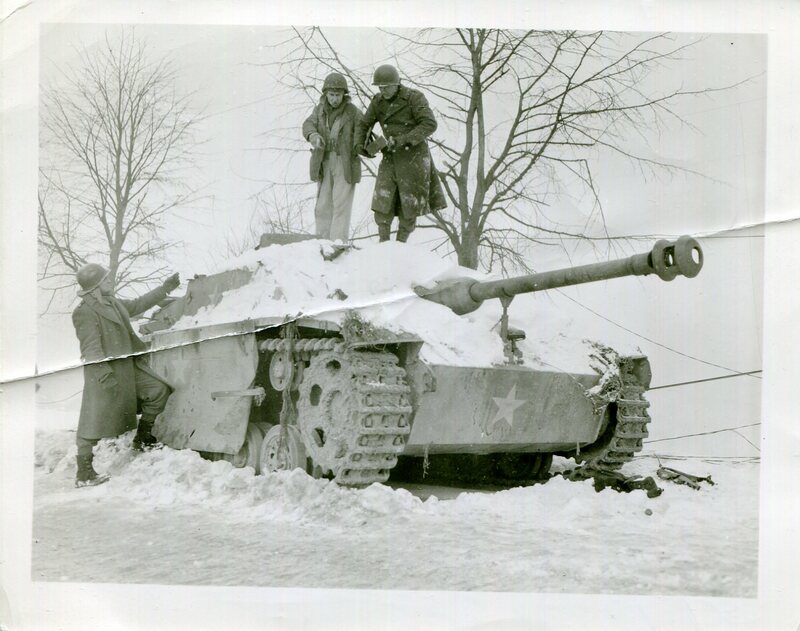 Battery B, 285th Field Artillery Observation Battalion, had encountered the advancing German column made up of armored vehicles from SS-Lieutenant Colonel Joachim Peiper’s elite Kampfgruppe, a spearhead element of the 1st SS Panzer Division Leibstandarte Adolf Hitler. The firefight that ensued was brief and lopsided; over eighty Americans surrendered to the men of the SS. Instead of marching the prisoners to the rear, however, the Germans assembled them in the field near Five Points and fired on them with machine guns. Most were killed, but a small number escaped. The three men Pergrin found were simply the first of a handful of survivors who straggled into Malmédy throughout the day on 17 December. This atrocity, though not taking place within the town itself, has become known as the Malmédy Massacre. The ensuing days saw Peiper’s tanks repeatedly frustrated as engineer units such as the 291st foiled their attempts to capture bridge crossings and road junctures in order to continue the German assault westward. Malmédy was a particularly bothersome thorn in Peiper’s side, as the 291st, with the help of elements of other units, held the town for the duration of the Battle of the Bulge. For this stubborn defense under the harshest of circumstances, the 291st Engineer Combat Battalion was awarded a Presidential Unit Citation. Eventually, the German offensive faltered. The Allies regained the momentum and launched a counteroffensive intended to break through into Germany itself. 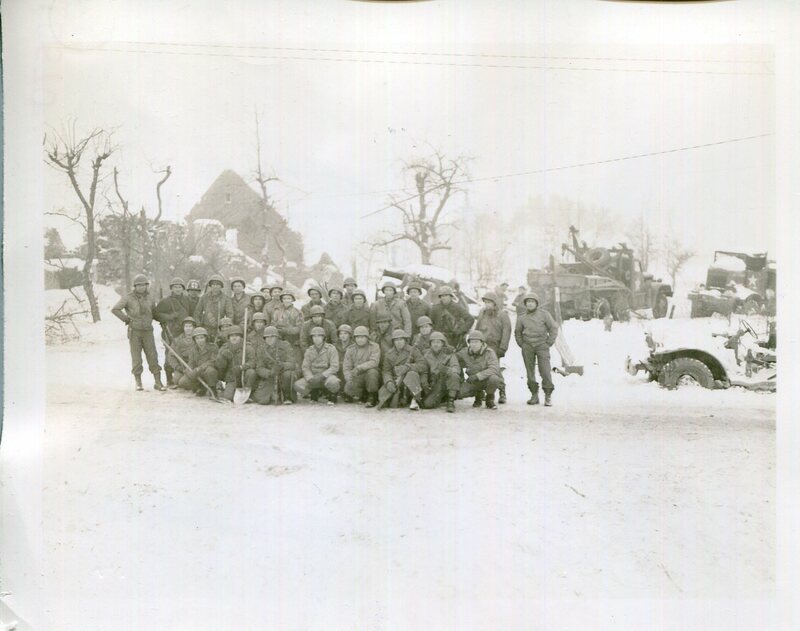 The 291st played an active role in supporting the Allied advance and First Army. On 8 February 1945, the 291st entered Germany. Although the Allies had crossed the border and entered Germany, they now faced a major obstacle: the mighty Rhine River, the last line of defense before the German heartland. The river’s crossing points were fiercely guarded by the Wehrmacht. One such crossing was at the town of Remagen, where the Ludendorff Bridge spanned the river and ended at the village of Erpel. One of the major crossing points of the Rhine, the Ludendorff Bridge, was the site of intense fighting. Because of the stiff German resistance, as well as an unsuccessful demolition attempt by Wehrmacht engineers that had nonetheless badly damaged the bridge, the American commanders decided not to wait for the Ludendorff Bridge to be secured before moving men and equipment to the eastern bank of the Rhine. American engineers soon received orders to construct a new bridge across the Rhine. As this order made its way down the chain of command, Colonel H. Wallis Anderson, commanding officer of the 1111th Engineer Combat Group, directed the 291st Engineer Combat Battalion to construct the bridge, which was to be an M2 steel treadway bridge capable of sustaining the width and weight of tanks and other heavy vehicles. Pergrin, though initially dumbstruck by the “enormity” of the task laid before him, got his battalion to work immediately. The 291st, with the help of a platoon of the 299th Engineer Combat Battalion and the 988th and 998th Treadway Bridge Companies, began construction at 0830 on 9 March 1945. The fanatical determination of the Germans to destroy the bridge was evident in the volume and intensity of fire received by the engineers as they struggled to span the river. The 291st and its fellow engineering units suffered numerous casualties and significant damage to their equipment, all as a result of constant German artillery barrages, occasional strafing by Luftwaffe aircraft, and even one incident where panzer units in Erpel laid down direct fire on the engineers and their construction site. Despite all these obstacles, Pergrin and his engineers completed the bridge, touching down on the east bank of the Rhine at 1710 hours on 10 March 1945, just under thirty-six hours after initial construction began. It was the first Allied bridge built across the Rhine, and remains the longest tactical bridge of its type ever assembled under enemy fire. Once again, the 291st Engineer Combat Battalion had greatly contributed to the success of the Allies against the Germans. 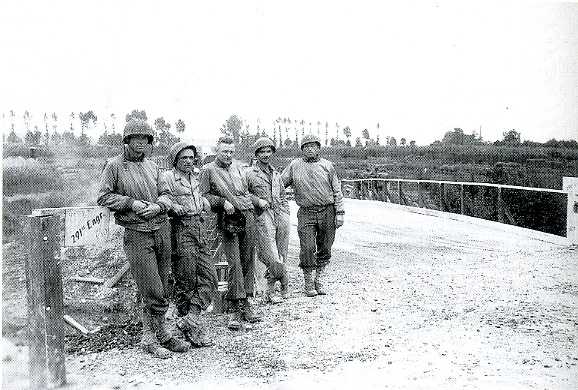 The last bridging assignment given to the 291st came after the battalion moved into Bavaria. 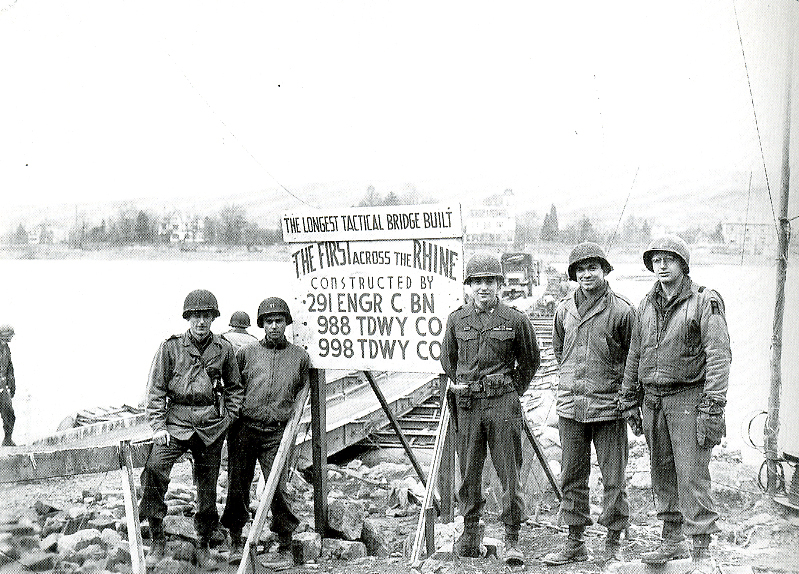 Along with the 324th Engineer Combat Battalion, the 291st was charged with bridging the Danube River at Heinhelm and began construction on 27 April 1945. Despite sporadic German artillery fire, the engineers completed the bridge shortly before nightfall on 28 April. Not long after, the war in Europe came to a close on 8 May 1945. The 291st remained in Germany with the occupation forces until 9 September 1945, at which point they were transferred to Camp Miami in Mailly, France. After boarding the SS St. Alban’s Victory on 11 October, the 291st arrived at Hampton Roads, Virginia, on 20 October. On the same day it arrived in the United States, the battalion was sent to Camp Patrick Henry, Virginia, where it was inactivated. The 291st was briefly activated once more, this time as a Kentucky National Guard unit, on 21 May 1947. After just three years, however, on 30 June 1950, the 291st Engineer Combat Battalion was finally inactivated and has remained inactive since. The deeds of the 291st’s men, however, will live on, forever recognized for their contributions that helped defeat Nazi Germany and win World War II.